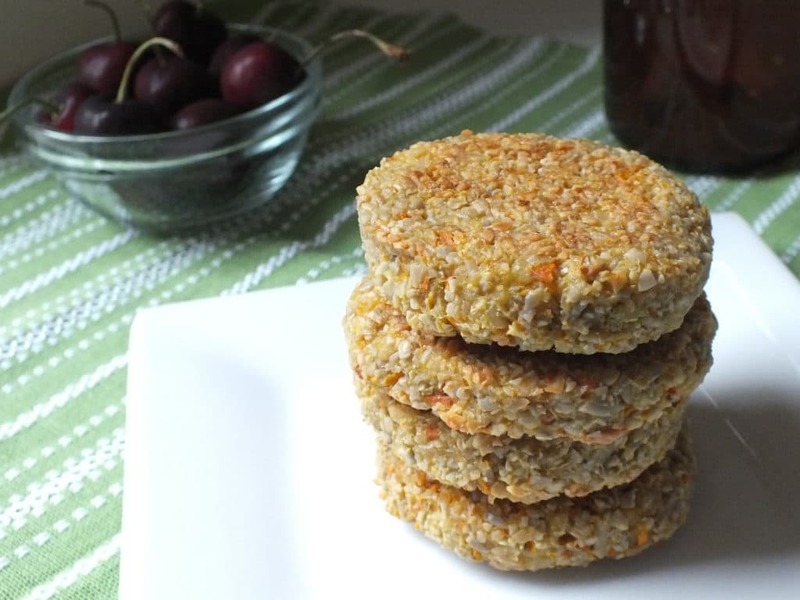 Veggie patties are a staple around here. They can be made of nearly anything – beans, rice, seeds, sweet potatoes, etc. – and they don’t take very long to throw together. 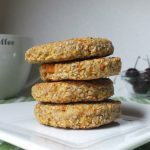 These are a reinterpretation of a store bought veggie burger that we used to buy often and they turned out way better than the original. 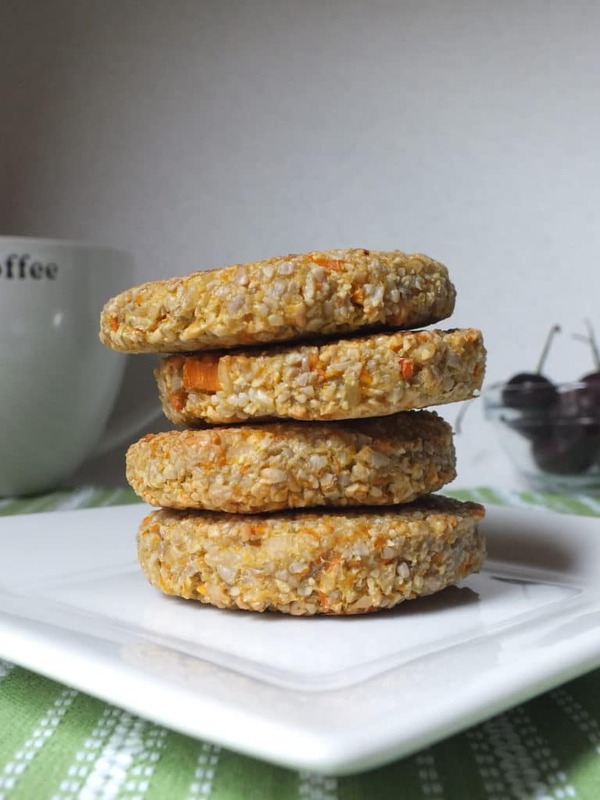 A lot of veggie patties seem to lack crunch or substance when you bite into them. This one is different. It’s slightly crispy on the outside, and perfectly soft and savory on the inside. Add rice and water to a pot and bring to a boil. Once it begins to boil, decrease heat to low and stir occasionally until the rice is cooked. Preheat the oven to 400°. 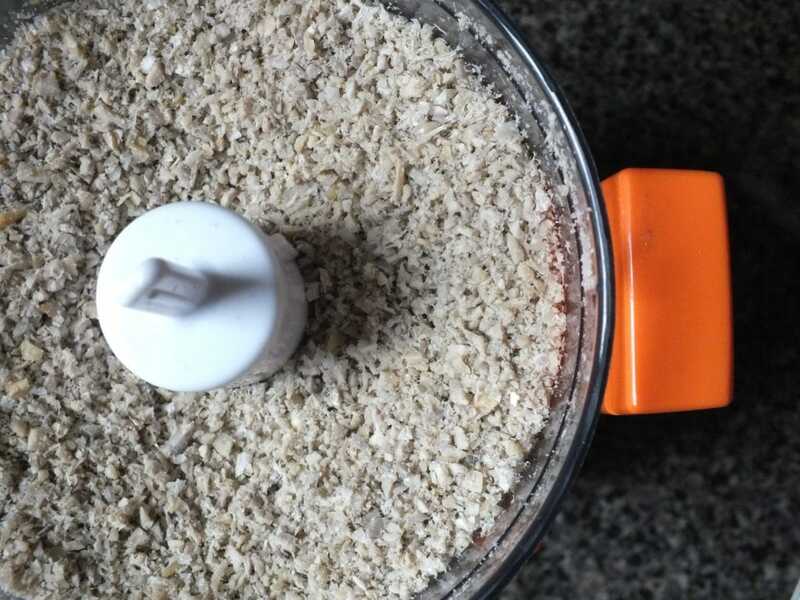 Add sunflower seeds to the food processor and pulse until they resemble a course powder. 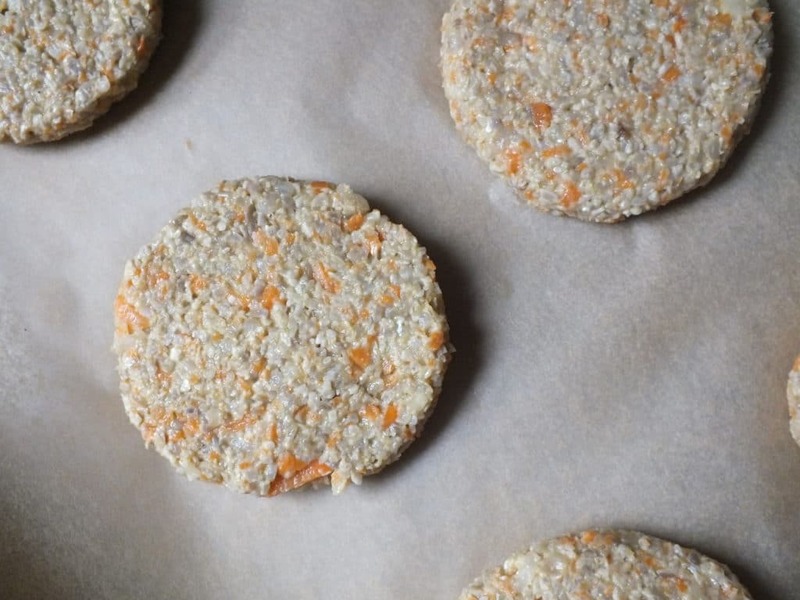 Add chopped carrots, cooked brown rice, garlic, and sea salt to the food processor and pulse until it becomes dough-like. Line a baking sheet with parchment paper or aluminum foil sprayed with olive oil. Then start creating your burgers. Bake patties for 18 minutes, flipping once at the halfway mark. We shaped ours into small, breakfast-sausage-sized patties because — well, we felt like it. But they could easily be made into bigger burgers. Simply increase the baking time by 2-4 minutes for traditional burger-sized patties. The patties are delicious on their own, but would be great served on a gluten-free bun or between some greens. Add a side of sweet potato fries to complete the burger experience. 1. Add rice and water to a pot and bring to a boil. Once it begins to boil, decrease heat to low and stir occasionally until the rice is cooked. 2. Preheat the oven to 400°. Add sunflower seeds to the food processor and pulse until they resemble a course powder. 3. 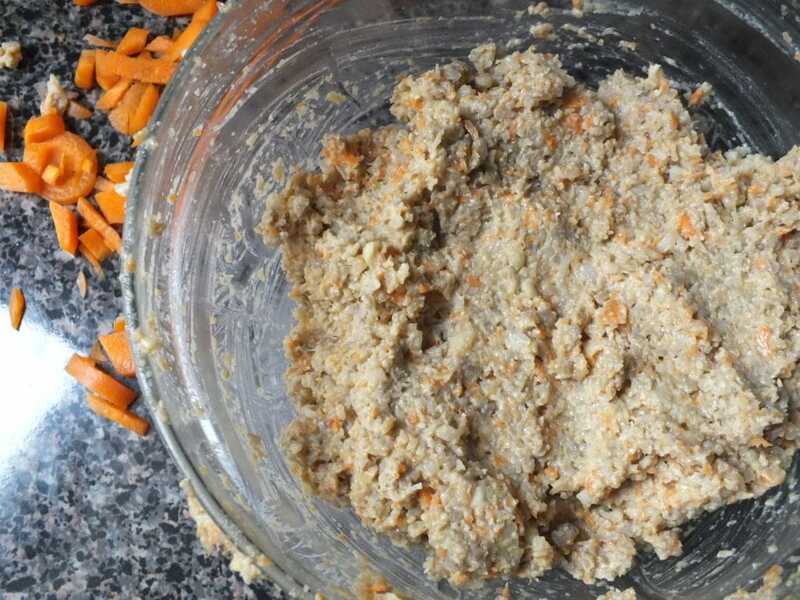 Add chopped carrots, cooked brown rice, garlic, and sea salt to the food processor and pulse until it becomes dough-like. 4. Line a baking sheet with parchment paper or aluminum foil sprayed with olive oil. Then start creating your burgers. Form 6-3″ patties. 5. Bake patties for 18-20 minutes, flipping once at the halfway mark. If you make larger patties, simply increase the baking time by 2-3 minutes. I have made this recipe multiple times. It is an absolute favorite for my kids. I’ve tried similar sunburger recipes, but none come close to this one. I serve it with homemade ketchup sweetened with raw honey. I’m making some tonight so visited this site to get the recipe and decided for the first time, to see if anyone else commented on the burgers. They are absolutely delicious. I double the recipe because three of us end up eating the whole batch! That’s so awesome! I’m glad that you and your kids all enjoy these. I agree – they’re delicious! I made this recipe and posted the results on my FB group page, “Raw Revolution” Group. It was really simple, and I liked the flavor. I used my own favorite herbs like cilantro. Awesome! I’m so glad you enjoyed. 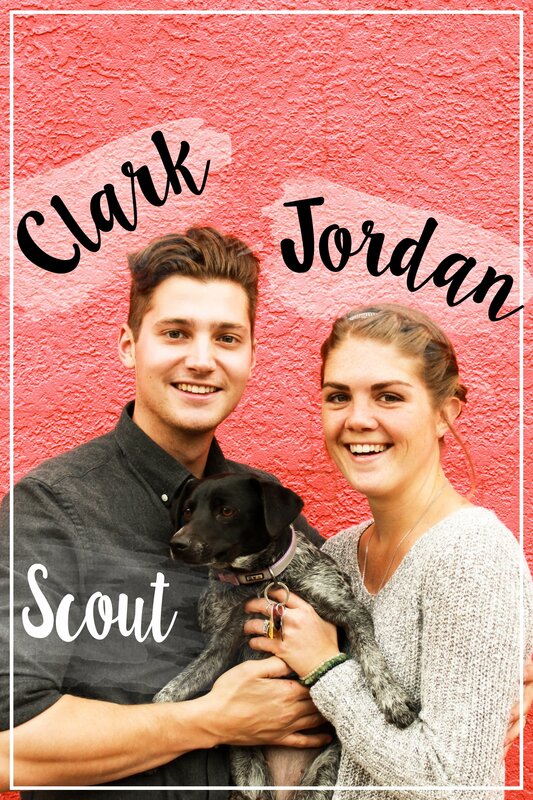 I’ll be checking out your FB page!